Signed into law on December 28, 1973, the Endangered Species Act of 1973 was created to protect plants and animals that are in danger of becoming extinct. Species are either listed as endangered or threatened through this act. Endangered species are species that are in danger of extinction throughout all or a significant portion of its range. Species that are threatened are likely to become endangered within the foreseeable future. The history of the Endangered Species Act spans over 110 years and is a commitment made to protect and restore species who are at risk of disappearing forever. The United States has been working to protect animals as early as 1903 when President Theodore Roosevelt created the National Wildlife Refuge at Pelican Island, Florida. 13 years later, in 1916, the United States and Great Britain created a system of protection for certain birds that migrate between the U.S. and Canada. The system was created on behalf of Canada and on July 3, 1918 was officially passed into law and called the Migratory Bird Treaty Act. It took almost 50 years for the next step in animal preservation to be made. The Endangered Species Preservation Act of 1966 which allowed authorized land acquisitions that conserved selected species of native fish and wildlife. 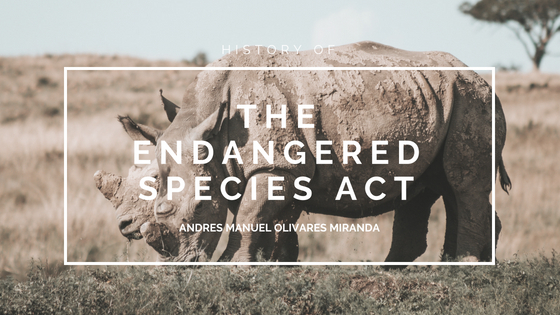 Then, 3 years later, the Endangered Species Conservation Act of 1969 not only expanded on the act put in place in 1966, it also authorized lists of animals that faced extinction worldwide. Crustaceans, mollusks and other sea creatures were also added to the list as protected creatures. These additions paved the way for what is now known as the Endangered Species Act of 1973. The act protects all plant and animal species listed as threatened or endangered and also protects their critical habitats (habitats that are vital to the survival of endangered or threatened species). The act has made plants and all invertebrates eligible for protection, required federal agencies to use authorities to conserve listed species, and has provided funding authority for land acquisition for foreign species. There are over 2,268 species listed as endangered or threatened, 673 of which are foreign species found in areas outside the United States. The list is constantly evolving adding animals as often as needed. Several species have also been saved by this act. The most notable species saved by the Endangered Species Act is the bald eagle. The bald eagle, which was close to extinction, rebounded through protection services. Today there are approximately 70,000 bald eagles in existence. The Endangered Species Act has been amended several times to include a variety of small changes and updates, but for the most part, the original act is what is followed today.